If you’re looking for a light therapy alarm clock with a reputable brand name, the HF3505 does what you need it to do for less than Philips' other wake-up lights. But it's still a pricey device—for its limited functionality, you may be better off buying a budget version from a less expensive brand. If you’re looking for a Philips light therapy alarm clock that isn't quite as pricey as their most premium options, the HF3505 is worth considering. You won’t get all the features and brightness/alarm options of some of the higher-end choices, and functionality-wise, it's on par with much less expensive alternatives. It depends on whether or not you're willing to spend extra for the brand name. At 7.9 inches in diameter and 4.5 inches in width, the HF3505 is compact very light, weighing only 0.7 pounds. The lamp section is a circular orb with a display interface in the middle, almost like a donut. The stand piece juts out more than other clocks though, making a bit wider what other clocks we’ve tested. Most of the buttons are on the front of the interface while the alarm sound settings, the clock time, and the display brightness, are located on the back of the stand. The HF3505 is compact very light, weighing only 0.7 pounds. Setting up the HF3505 is very basic and can be done quickly. The clock comes in two parts: the clock interface and the power cord, which easily inserts itself into a port in the back of the clock and then plugs into any wall outlet in a home. We simply plugged in the cord and the wall plug and the clock began to flash bright orange numbers. An important note—this will not work in a power outage since there’s no backup battery. Configuring the clock proved to be a little bit tricky. The HF3505 wanted us to set the time in 24-hour time. In order to change this, we needed to press and hold the clock time on the back for two seconds and then press it again to swap between formats. We also noted that the interface brightness button was located in the back of the clock, giving us four different brightness options, but in a very inconvenient location. Setting the alarm proved easier, as you simply press the alarm button, a bell-shaped button on the front interface, and the alarm time flashes. Simply press this button, set the time, and you’re ready to go. However, setting the brightness and the audio requires more effort. We discovered you can set these while we used the handy test feature by holding the alarm button for five seconds. This allowed us to watch the entire alarm process in the span of 90 seconds, and alter these settings during the testing period. Otherwise, to set these features, the light button, and the alarm audio were in two separate, inconvenient locations — the front interface, and the back stand, respectively. In order to set the alarm audio, there is a switch featuring three model—the first alarm sound, a second, and the FM radio option. Technically, this is three different audio options. However, the alarm audio that Philips provides is two birdsong clips, making the alarms lack variety. Also, since it provides only bird-based audio, cat owners, beware—furry friends may not appreciate hearing birds in the bedroom at 5 a.m., as we discovered. This clock also doesn’t offer phone USB charging or an audio jack. Using the alarm in the morning was very easy. 30 minutes before alarm time, the HF3505’s yellow-hued LED bulb gradually brightens from 0% brightness to maximum. There are a total of 10 brightness levels. While great for the alarm itself, they also came in handy for doubling as a night light and a basic, albeit dim reading lamp. The alarm audio that Philips provides is two birdsong clips, making the alarms lack variety. At alarm time, the audio begins to play—we tested all three—and the audio increased in volume for 90 seconds until it reached the set volume level. The birdsong alarms rang through the room, crisp and clear. However, in testing the FM radio alarm and the general FM radio option, the audio became a little garbled. We tried adjusting the wire antenna that is attached to the back, but this didn’t help the audio. Music particularly didn’t carry as well as we’d like it to. Snoozing was also easy. Tapping the top of the alarm causes the audio to fade for nine minutes. After nine minutes, the audio returns and rises to the original volume. Turning it off was also easy, just tap the alarm button, which while small, is brightly lit with orange light. Tapping it once turns it off completely, which means that every night you have to reset the alarm. This is easy though, as the alarm status will show up a bell-shaped light on in the center of the interface, to the right of the time. At $89.99 (Amazon), the Philips HF3505 is pretty expensive but not outrageous compared to similar brand-name light therapy alarm clocks. If you’re looking for a light therapy clock from a reputable seller, this would be a solid choice. However, if you’re looking for more amenities in a light therapy alarm clock you may need to spend more on something like the Philips HF3520 or Somneo. 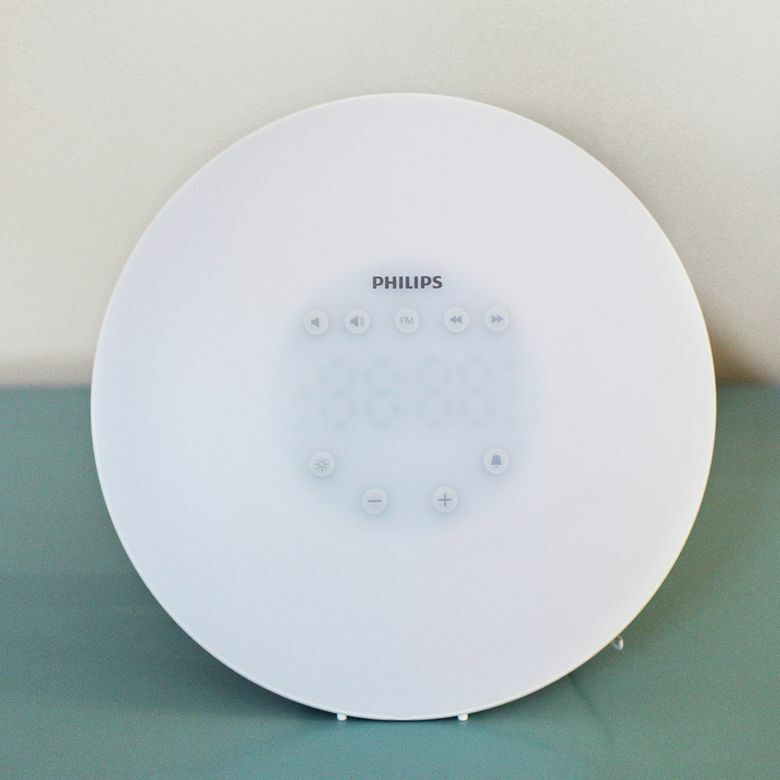 Compared to the Totobay 2nd Generation Wake-Up Light, which costs less than $30, the Philips HF3505 doesn't offer much in the way of extras. One nice feature that sets the Philips apart is the bulb itself — the Totobay comes on at 10%, whereas the Philips bulb gradually brightens from 0%, meaning that there’s less chance of you waking up 20 minutes early because you happened to be facing toward the lamp. But if you aren't bothered by that difference, then there's not much reason to spend extra on the Philips HF3505. It's only a bit better but costs a lot more, which makes this Philips clock difficult to recommend for the price. Still can't decide if the Philips HF3505 is right for you? Take a look at some of the best wake up light therapy alarm clocks. A nice way to wake up, but with too few functions to justify the price. The Philips HF3505 is a good wake-up light, and the brand name recognition is appealing. But it lacks a lot of the features of Philips' higher-end options. Functionality wise, you're probably better off buying a much cheaper lamp like the Totobay. Product Dimensions 7.9 x 7.9 x 4.5 in.